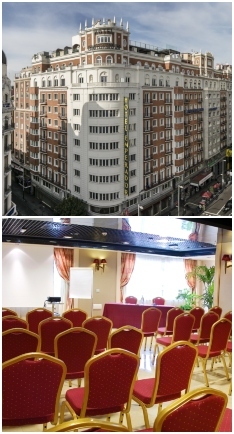 Hotel Emperador offers a privileged location in the heart of Madrid, the famous Gran Vía. On the tenth floor you will find a fantastic terrace, that since December 2017 opens all year around, where the weather is never a problem, since they have covered areas with heating systhem suitable for cold and rainy days. From May to September you can enjoy its terrace located on the 10th floor, which is an amazing Roof Garden with Solarium, Pool and Cocktail Bar. From the sun beds and chill out areas, you can enjoy breathtaking views over the city of Madrid. Enjoy a nice BBQ with your group and compose your menu depending on your preferences. 232 guest rooms combine classical elegance and comfort with services of a 4-star hotel. The hotel can offer twin bedded rooms for a group of maximum 100 persons. For your business meetings and social functions, the hotel offers 12 meeting rooms within 1000 sq meters, some of them with natural daylight and excellent views over Gran Via. All are equipped with the latest technology, and offer different types of events, accommodating from 10 to 250 guests. Just 650m away from the hotel you can find the emblematic “Plaza Mayor” with its restaurants and monuments and Puerta del Sol is located just 10 minutes away in walking distance. Gran Via is known for shopping, theaters and action 24 hours a day.